Ericsson today made its first announcement of a commercially available radio – the AIR 6468 – that aligns to the 3GPP’s 5G New Radio development path. The company said it would have a new radio product, featuring new antenna tech as well as its existing but still very recent Radio System Baseband 5216 baseband, available in 2017. This radio will be sufficient to be termed a 5G New Radio, the company said. Note that 3GPP will not begin its specification work for 5G New Radio until March 2017, so any definition of a New Radio has to be, as yet, at best predictive. Ericsson said that the 6468 will have 64 steerable ports, enabling capabilities such as Massive-MIMO and then MU-MIMO. On Twitter, where it is likely Ericsson’s employees are tweeting agreed lines from within the company, several accounts were mentioning the idea of 5G “components”. 5G components as a terminology is interesting because it means you can release certain elements of what will undoubtedly be included in a New Radio – such as beam forming, massive MIMO, MU-MIMO – in a step-by-step manner, instead of releasing a single new 5G system in its entirety. However, that said, Ericsson’s New Radio is a new box, featuring a new baseband, and therefore gives the company enough cover to proclaim it the first 5G New Radio. Note, as with other Ericsson radio announcements, the release date is pretty vague, and still some way off. Vendors do this for two reasons – first, to be able to say they are first, even if there is no available product. Second, if they suspect rivals are about to announce or deploy competitive solutions, they can delay the market a little. In this instance though, the reason is different. This is actually an early announcement of an early product release: given the established 5G timelines 2017 is a bold move from Ericsson designed to steal some headlines. Additionally, Ericsson announced the coming availability of a clutch of new radio and baseband capabilities, forming hardware elements that its 5G PlugIns can run on. Many of these PlugIns prefigure features that are also likely to be deployed within a 5G network. This will now be a common theme among radio vendors, who are providing 5G components that can be deployed on non-5G infrastructure. As previously noted by TMN, vendors have gone for 5G-Ready (Nokia), 5G-Plug-Ins (Ericssson) and pre-5G (ZTE) to denote this approach. 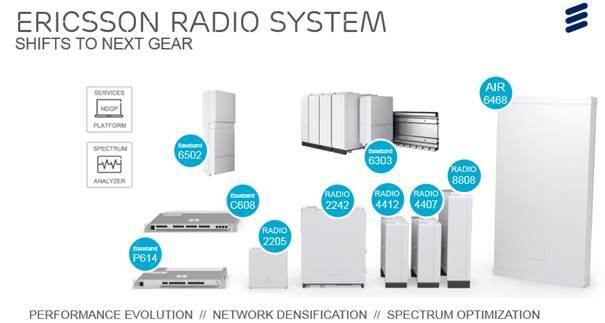 The new Ericsson Radio System elements are: an FDD and a TDD 4x4MIMO radio, a TDD advanced beamforming radio, and a micro cell that can operate in unlicensed spectrum using the same baseband as the licensed solution. There are also two new basebands, one outdoor macro and one micro, that can be fitted on Ericsson’s recent Rail System mounting. Another baseband is designed to reduce PIM at site installations. There will also be software features such as integrated spectrum interference analysis, and a wideband radio that can share power between carriers.